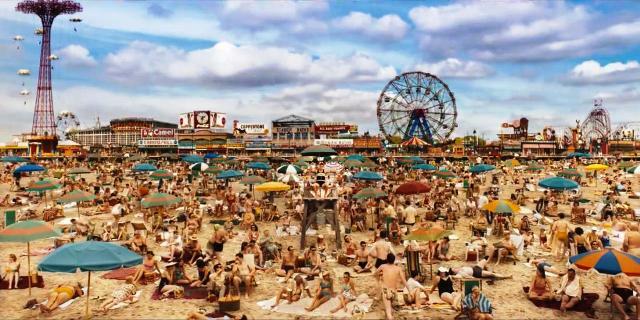 Bathed in the glow of maestro cinematographer Vittorio Storaro’s lens, Woody Allen’s Wonder Wheel turns 1950’s Coney Island into Wonderland, rather than the cheap pleasure dome it was. Our Alice is an emotionally fraught former actress, Ginny (Kate Winslet), who has ended up as a waitress in a clam bar, married to a carousel operator, Humpty (Jim Belushi), but wracked with guilt because she cheated on her first husband (who she loved and who she believes was destroyed by her betrayal). Her anxiety brings on headaches, exacerbated by her down-at-heel situation and less than glamourous life. A chance meeting with a good-looking, charismatic lifeguard, Mickey (Justin Timberlake), a struggling playwright, sends her down the rabbit hole and into a passionate affair which is threatened when Humpty’s hot young daughter, Carolina (Juno Temple), returns home after her marriage to a mobster collapses. Mickey is smitten with Carolina and vice versa. From that moment on, Allen’s script takes his audience on a roller coaster ride of lust, jealousy and betrayal. Winslet gives a searing performance which at times veers into pathos, channelling the likes of Crawford, Davis or Vivien Leigh, for the film has a very play-like structure; it’s not hard to imagine the work on stage. In fact, Mickey prefaces the tale as though it’s perhaps a creation of the budding playwright’s own. Winslet appropriately reins it in though, exuding the wit and cunning that got Ginny into such a position in the first place. And this is the essence of Allen’s characterization of the woman, for he makes us feel sorry for her even though we’re all too aware of her failings. After all, she is only human. Belushi is solid as the rough and ready partner who likes to go fishing with his mates and is constantly perplexed by his wife’s lack of desire to join in the activities he proposes. For many years he was estranged from Carolina, his daughter from a previous relationship, and even though he’s initially annoyed when she returns he soon becomes overly protective, admitting he missed her presence deeply. Once again Allen seeks forgiveness for his characters’ failings. There is strong Oscar buzz around Winslet’s performance. She does ‘wounded’ well and this is a slight departure from her usual roles. Belushi, Timberlake and Temple are also perfect in their parts. Santo Loquasto’s production design is exemplary and he captures the period and the location in all its glory. Coney Island’s giant Ferris wheel has an overpowering presence and the use of light and colour creates an almost surreal atmosphere, which adds to the characters’ highs and lows. Wonder Wheel has the potential to both delight and depress its audience - it will be interesting to see if the pundits have indeed picked a winner in the lead-up to Judgement Day at the Academy Awards next year. Or will she suffer from a backlash due to her performance being in a Woody Allen film?